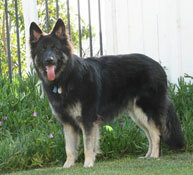 Barak was a wonderful dog, a loving companion, and an excellent ambassador for Shiloh Shepherds. He went with us everywhere, and many people were touched by his love and gentleness. He was only with us a short time, but his love and happiness will stay with our family forever.